An attack of depression, a visit to the doctor interrupted by a cellphone call, a fairly tense afternoon, and a good swim in the evening. Yesterday was a truly odd day. So, just in case the well in our backyard is a wishing well, I tossed a penny in and wished that the yellowjackets would go away by next week. I wanted to wish for world peace, but you'd have to have a really powerful wishing well for that, and this one... well, it's only ten feet deep. I'm not sure it's got that kind of power. And then I thought of wishing for all the folks who lost their homes in the hurricanes to get back on their feet quickly... but again, this is just a backyard well. I'm not sure how much good a wish like that would do. Then I thought I ought to wish for something for Eric and I, but all the wishes I came up with seemed too greedy (like wanting the mortgage to be paid off). So I decided to wish for something that would benefit the mighty missionaries in the incredibly unlikely event that it worked. The penny made an interesting *plop* sound when it hit the bottom. They seem determined to come over and wreak havoc with the vegetation running wild in the back yard. This week there were four of them again, complete with two machetes, a hand saw, and a pitchfork. They were disappointed to discover that the bees' nest was still very much active and alive, even after last week's adventure with gasoline. I looked it up on the 'net, and it appears we have a yellowjacket nest. The only way to really get rid of the suckers is to completely cover their nest and smother them. Due to the location of the nest, I don't think that's really likely. I suggested that the missionaries work around them, which they mostly did today. I bought some cookie dough for them, and made fresh warm cookies again. Again, they appreciated it. Fresh cookies and Gatorade. The other three guys were pulling the branches he'd cut into another part of the yard, away from the yellowjacket's nest, which was almost directly under the tree he's standing in. Right after I took this picture, he sawed off the branch he was standing on. No, I'm not joking. At least in this tree he didn't go nearly as high as the other guy did in the first tree. The pile of wood in the foreground was cut by the missionaries last week. I ought to start hauling it around the house and put it on the porch before the rains come. If we get our wood-burning stove checked and fixed again, we have plenty of wood to burn in it. Happy birthday to my niece Amanda, who is almost old enough to drive now... wowsa. Eric says that the teams playing are Inglemoor and Woodinville. He knows this because he taught at Inglemoor today. I've learned more about hurricanes in the last few weeks than I even expected to know, living in the Pacific Northwest. I've learned that hurricanes go through phases of weakening and strengthening, and that sometimes predictions about a hurricane's strength are useless because of those phases. I've learned what atmospheric pressure means in relation to the strength of a hurricane. And I've learned that some people actually believe that the Yakuza has a weather control device. But mostly I've learned that it's impossible to get everyone away. I'm stunned by the fact that thousands of people in Houston simply cannot get out, as seen in this story. Some who have the means just can't get out because of the traffic. Nobody wants to be caught out in the storm in just their car or on foot, so they are actually turning back since the traffic isn't moving at all. After Katrina, everyone is taking Rita seriously, but even when they want to get away, they can't. To anyone in the hurricane's path: Good luck and God bless. Stay strong. We're thinking of you. Hi, there, folks. Hubby-Eric here, finally with something to say. I was pretty excited about tonight, as Laura and I had tickets to a free preview screening of Corpse Bride, the new Tim Burton animated movie. But wouldn't you know, we both got the latest bug going around. I thought I might be able to make it, but I left the final decision to Laura, and she just wasn't up to it. Oh, well. I'm sure I'll get a chance to see it again some time (hey, it opens in theaters on Friday anyway). And to be honest, with the way we're both feeling right now, it may be just as well we didn't see it tonight. I've mentioned before that I don't really cook. I have the tools, but not the practice, and I've made most of the mistakes it is possible to make. Recently I subscribed to a couple of food newsletters. One from Food Network, and one from Kraft Foods. While 99% of the recipes they send me don't appeal to me, recently I saw one that I thought I might be able to manage, so I saved it. And last night, without telling Eric what I was making, I made it. Ingredients: one pound ground beef, 1 package KRAFT Macaroni & Cheese Dinner, 2 cups water, BBQ sauce (about 1/2 cup), and 1 cup tomato sauce. Large skillet, non-stick, with lid. Optional: toppings like fresh lettuce, tomatoes, or shredded cheese. Brown the beef then drain. Add the noodles, water, and BBQ sauce and bring to a boil. Once it comes to a boil, turn the heat down to medium and cover. Simmer for about 8 minutes or until the mix thickens, stirring a couple of times. Remove the cover, add the cheese sauce mix and tomato sauce and stir until it's really well mixed. Serve immediately and top with any toppings you feel like (I used shredded cheese). Leftovers need to be refrigerated. Makes about 4 adult-size servings. Kid-sizes may vary. Preparation time is about 20 minutes. Goes best with some sort of veggie. I used corn this time, but I think carrots would work really well. It didn't really need any extra seasoning, but that will depend in part on what kind of BBQ sauce you use. Try not to use BBQ sauce that will clash with the cheese sauce too much. I don't have any good ideas for experimenting on it for next time... it turned out really well this time around. I'm putting my recipes on the blog mostly to keep a record of what has been successful for me. I'm not a daring cook, and I'm usually not willing to spend a lot of time in prepping food. But I actually kind of like cooking, and I'm always looking for something different to serve. The same four dishes week after week get tiring even for me. Add in the fact that I'm really a very picky eater, and finding recipes becomes an annoying chore. So having a record of other recipes is a good thing... and hey, this is the boring blog, so it fits right in! They came again today, this time with a half-gallon jug of gasoline to pour on the bees' nest (no, they didn't light it). They cleared out a lot of vegetation in the time they were here, and also took down the "tree house" from the backyard. When we moved into this house, in addition to the mysterious wellhouse, there was a platform up between two trees with a solid wooden ladder up to it. It was a tree house. My brother climbed up the ladder and checked it out, and pronounced it solid but slightly dangerous. When the missionaries first started work on the backyard a couple of weeks ago, one of them climbed up onto the platform and noted that some of the planks were rotting, and some of the nails no longer held, making it extremely dangerous. Thus, when they asked if they could take it down, I only had to think about it for a few seconds before agreeing. And they had a LOT of fun taking it down, too. If you want to keep four 20-year old boys happy, give 'em something to destroy. They took turns chopping the beams down after they took turns whacking the supports until the thing finally fell. Luckily, it didn't fall on any of them, although one of them nearly managed to get the ladder on his head. In addition to the missionaries, the visiting teachers came over. When they called, I mentioned that the missionaries were in our back yard, so they brought over some cookie dough. I cooked up a couple of batches of cookies for the missionaries and they had a nice lunch of cookies and gatorade. Warm cookies, fresh out of the oven, will also make missionaries happy. The missionaries also uncovered a short stone stairway when they removed one of the rhododendron bushes. All four of the rhodies are way too close to the house and will have to go. They took out the biggest one first, and found it was covering the stairway up from the back walkway into the yard. Since the yard for part of the distance is about two feet up from the walkway, it's nice to have some steps instead of having to climb. One of the visiting teachers noted the spiders that infest our house, and mentioned that spraying down the outside of the house with a 50% bleach to water solution will get rid of a large number of them. I will have to seriously consider that now, as the spiders are driving me slightly nuts. The missionaries also noted the spiders and started pointing to "large" ones, all of which were tiny compared to the big hunter spiders we get inside the house. One of the missionaries expressed a fear of spider bites, and I reassured him that there are no poisonous spiders native to this area, and no non-natives are likely to survive long in our climate, so he's pretty safe, all told. Of course, those reassurances never seem to work with me, so I doubt they calmed his nerves all that much. The M's have just guaranteed a better record this season than last season, with their 64th win. Last season the M's went 63-99, their fourth worst season ever. Update: One of them got stung, but not too bad. I decided to not get close enough to identify which flying insect is in the nest for sure. Two of the other missionaries are going door to door in the neighborhood... not preaching but asking the neighbors if they can borrow their yard waste bins. They seem to be having some success. Polite Scott describes helping victims of Katrina. More benefits to help victims of the hurricane. And Bendis is auctioning off the first Powers cover as well. A volunteer's story. Via Garrett. A survivor's story. Via This Modern World. An amazing slideshow of photos from NOLA before and after the hurricane. Watch this one all the way through, it's worth it for the perspective it gives. The New Orleans talking blues. Via Making Light. Boing Boing has a picture of Floodweiser. Stuart Hughes directs us to a lesson about how to write captions for TV news. The Seattle Weekly weighs in on the disaster. The conspiracy theories have already started. The Museum of Hoaxes has one about Yakuza causing the hurricane. Insurance companies might try to claim that damage in NOLA wasn't a hurricane to keep from paying out. Snopes takes on a neo-con talking point about the Katrina disaster. Fafblog has do-it-yourself disaster remedies. ExxonMobil made $10 billion this quarter. And people want the states to cut taxes on gasoline. How about the oil companies be punished for profiteering, instead? How much more money does the oil industry stand to make on the Katrina disaster? And, if you read the article, you'll see that Bush just gave ExxonMobil a tax break. Lovely. Bush just adds insult to injury. Via Mah Two Cents. And forget about the first admendment, too. (ok, I admit, this is less a first admendment issue than a stupid bureaucracy issue, but the segue was to good to pass up). The Red Cross wouldn't go into NOLA, and the people in the cityweren't allowed to leave. More here. The Red Cross can't get into New Orleans, but mercenaries can. The folks of Southern Louisiana introduce themselves. The man who told Cheney to "Go Cheney himself" was detained. He had lost everything in the hurricane, and says he was only throwing Cheney's own words back at him. Via C&L. And lastly: Those were the days. Via MetaFilter. Great news! Michael "there are people at the convention center?" Brown has been removed from duties relating to hurricane Katrina, and an experienced Coast Guard Vice Admiral has been put in charge instead! Bad news... Brown hasn't been fired as director of FEMA (and there's another three storms lurking in the Atlantic) and this move should've been made over a week ago, when Vice Admiral Thad Allen's expertise could have saved hundreds of lives. Still, it's a start. A very small start, but a start in the right direction nonetheless. Elayne has a list of heroes of New Orleans. Comic Book Related Charity efforts. Also more information here. FilkerTom suggests Network for Good. Harry Potter fans continue to raise money. Polite Scott is going to assist refugees. Thank you, Scott, and we can wait for the story dissections. A great story (LA Times) about a Vietnamese Houston Mall owner who took in and helped refugees from NOLA. Thanks for the link, Garrett. News about the Aquarium and Zoos. Here is a very good timeline of events in the disaster. A fascinating view of the Austin Convention Center from Jasmina Tesanovic. Read this one. It's uplifting in a great many ways. $2000 won't go far, but it will help a lot right now. Perhaps the absolute best news yet, Coast Guard's Chief of Staff To Assist FEMA (Washington Post). If Brown is smart, he'll give Allen control since the guy has actual credentials and knows how to help people in a disaster. Via Collective Sigh. Medication for refugees. One reason people are having a really difficult time is because they don't have their medications with them, and going "cold turkey" can cause huge problems. Truly Chilling, an account from Charmaine Neville of the events in NOLA. This is a video, but it's worth watching. When did facts become opinion? An EPA accounting of New Orleans. Another FEMA screw-up: FEMA webpages only accessible via IE or installing special software on other browsers. If we had a leader in this country, the head of FEMA would already have been replaced. Yet more FEMA stupidity. When did FEMA become so useless? Navy pilots are reprimanded for rescuing people using helicopters specifically designed for rescue operations. The Blame Game. And, why now is absolutely the best time to "play the blame game". Check out Here's What Gets Me. And Garrett fumes. Meanwhile, Bush doesn't think anything went wrong. That might be because newspapers in Bushworld have completely different stories than in the real world. Here's what I don't blame Bush and FEMA for: I don't blame them for the hurricane, nor for the lack of evacuation plans (that was truly a local issue). I don't blame them for the deaths that happened during and immediately after the hurricane. I don't even blame them for the failure of the levees, unlike many others, because the problems with the levees started 40 years ago. Here's what I do blame Bush and FEMA for: The lack of security in the city following the hurricane. The National Guard should have been in the city in force within 24 hours after the storm had passed. The city was accessible and everyone with a brain knew there was damage (a category 4 hurricane hit, you'd have to be a true moron to not realize the city needed the Guard immediately). The fact that no one evacuated the people left in the city for days after the hurricane (pre-hurricane=local problem, post-hurricane=FEMA's problem -- in short, once the disaster hit, the whole area was FEMA's responsibility by law). Any deaths that could have been prevented if the Guard entered the city in a timely manner are on Bush and FEMA's head. The fact that the levee wasn't being repaired soon after it broke is FEMA's fault and Bush's responsibility. The refusal to let the Red Cross into the city is FEMA's fault and Bush's responsibility. How the DNC reacted to hurricane Katrina. Wonkette found an example of FEMA moving very fast, indeed. Don't forget the poor died all over. More timelines. These will eventually be crucial in determining what went wrong so we can prevent it from happening again. The Daily Show's list of Bush Admin Disasters is truly one of the funniest things I've seen in these horrible recent days. Making Light continues their excellent coverage of the hurricane with an article about how people were forced to stay in NOLA when there was no help available inside the city. Slightly unrelated: Bush by the Numbers. Also, Chemo patients forced to reschedule because Bush was going to visit. If you know anything about chemo, you know rescheduling is a REALLY bad thing. Bush's visit may well have cost people their lives. *A note regarding the word "refugees". I have heard it argued that the word is somehow racist. It isn't. It's a word about people taking refuge from something. In this case that something is the dangers of disease in NOLA. I've heard it argued that the word has negative connotations. Of course it does! It implies disaster of some sort. I've heard it argued that it implies poor black people. It doesn't to me. My first thought when I hear "refugee" is of Serbia. And so, I'll continue to use the word. If it offends you, I suggest you find something better to do with your time than read my blog. Jeff Parker is selling off artwork to help victims of Katrina. More info here. Tom Spurgeon has a roundup of support projects. Be sure to check out Warren Craghead's offer. Johnny B has a link to The Webcomic Hurricane Relief Telethon. Harry Potter fans are ganging up to help the victims of Katrina. John Ford reminds us of the symptoms of stress, symptoms which may mean we've been following the disaster too closely. Here's a brilliant idea to help victims of Katrina: virtualize all the nonworking phone numbers in the stricken area. That way people can claim their numbers, set up voice mail, and be able to tell others they are all right. Russell Shaw has another proposal on how to help victims of Hurricane Katrina recover from what is likely to be crushing debt. A group of kids get together and raise $1710 to help victims of Katrina. Three students from Duke University mounted a rescue operation of their own. Amazing. Simply incredible. Anne Rice on what it means to lose New Orleans (NY Times, Reg may be required). Via Kos. The amazing story of Deamonte Love, age 6, and the children he protected. Via TalkLeft. Stephen Fry on the smell of disaster. Another list of charities. Also, check out Charity Navigator before you give to be sure your money is going to someone who will help. Firstbook is donating books to children in the devastated areas. If you donate $5, they'll thrown in another book on top of it. Via bookslut. I just think we all need the reminder, especially folks who consider themselves Christian, right now. I'm afraid this is going to be pretty political, because I can't divide the disaster from the people in leadership positions who made it so much worse by not doing their jobs. US Army Reserves members have had enough. But compassionate conservatives show their hate, using the "n-word" to describe the hurricane victims. MR. BROUSSARD: ...that have worked 24/7. They're burned out, the doctors, the nurses. And I want to give you one last story and I'll shut up and let you tell me whatever you want to tell me. The guy who runs this building I'm in, emergency management, he's responsible for everything. His mother was trapped in St. Bernard nursing home and every day she called him and said, "Are you coming, son? Is somebody coming?" And he said, "Yeah, Mama, somebody's coming to get you. Somebody's coming to get you on Tuesday. Somebody's coming to get you on Wednesday. Somebody's coming to get you on Thursday. Somebody's coming to get you on Friday." And she drowned Friday night. She drowned Friday night. . . Nobody's coming to get us. Nobody's coming to get us. The secretary has promised. Everybody's promised. They've had press conferences. I'm sick of the press conferences. For God sakes, shut up and send us somebody. Bush sat on his hands. He played guitar, ate cake, and IGNORED the disaster. He could have saved hundreds of lives by simply picking up his phone and saying "Get the National Guard in there, now." That's all he had to do. Nothing more. The absolute minimum. He didn't. He abandoned those people to die. He appointed complete incompetents to the head of FEMA and the DHS, just because they were his old drinking buddies. Then, when disaster struck, for the SECOND TIME in his presidency, he did nothing. NOTHING. Five days. It took FIVE DAYS for help to arrive. We responded faster to the Tsunami. If you don't think the Iraq war is an impeachable offense, well, what about this? Blatant dereliction of duty and criminal negligence. You watch that video, then you tell me that Bush did everything in his power to help. You can't, because it's a lie. Bush did NOTHING. Indifference is a Weapon of Mass Destruction. And Bush has a whole lot of it. We heard you loud and clear Friday when you visited our devastated city and the Gulf Coast and said, "What is not working, we're going to make it right." Bienville built New Orleans where he built it for one main reason: It's accessible. The city between the Mississippi River and Lake Pontchartrain was easy to reach in 1718. Despite the city's multiple points of entry, our nation's bureaucrats spent days after last week's hurricane wringing their hands, lamenting the fact that they could neither rescue the city's stranded victims nor bring them food, water and medical supplies. I've been blogging quite a bit over on Bloggity about the hurricane. This is a sample of what I've been posting. How to get a temporary job in disaster relief. I think I want to take those courses anyway, just to be ready. If the hurricane has taught us anything, it's that we need to be ready for disaster and have a week's worth of food and water available. Speaking of being ready, here's a list of items to put in emergency kits, and advice on how to maintain those kits. Maybe we should start working on one ourselves. Via Garrett. Boing Boing links to an essay on being poor. I recognize a few of those, enough to know that I have tasted poverty, but never really been poor. This is the face of a hero. Eighteen-year-old Jabbor Gibson commandeered an abandoned school bus and took 100 people out of New Orleans to the Astrodome in Houston. He deserves honor. He might get jail for "stealing" the bus. "I dont care if I get blamed for it," Gibson said, "as long as I saved my people." He did what the National Guard didn't do: he didn't wait for orders, but went out and saved lives. He's a hero. God bless this man and give him the honor and praise he deserves. Via Boing Boing. Wired directs us to a "Wiki" Map that allows people to describe the devastation in New Orleans by location. CNN compares and contrasts the reactions of people on the ground in New Orleans to the utterly incompetent Michael Brown, head of FEMA and criminally negligent. If Brown doesn't serve prison time for this, there is no justice in the world. Speaking of incompetence, MetaFilter has more on the people responsible for the failure of rescue efforts, and a roundup of FEMA/DHS's imcompetence leading to the crippling of relief efforts. You would think, from the links, that FEMA/DHS wants everyone left in NOLA to die. We know who is at fault. From their own website: "In the event of a terrorist attack, natural disaster or other large-scale emergency, the Department of Homeland Security will assume primary responsibility". Everyone in leadership positions at DHS and FEMA should be charged with criminal negligance and thrown in prison, preferably one that's still filled with dirty water from the hurricane, and left to rot. They didn't even make the most basic effort to help until it was too late for far too many, and their refusal to give the orders to let others help directly contributed to the deaths of hundreds, if not thousands, of people. We had Americans on the ground helping recover from the Tsunami half a world away faster than we got help into New Orleans. And now the [censored] in charge of "Homeland Security" are keeping people in the city AT GUNPOINT. They won't let the Red Cross in, and they refuse to let the people out! And apparently our government is at war with the citizens of New Orleans, as they are now calling them "the insurgency". That would explain why Michael Chertoff and DHS are so determined to make sure they die. Via Warren Ellis. The cops are turning away volunteers and donations at the Astrodome, even though they are desperately needed. What idiot is in charge down there?!??? Kos is hopeful about bipartisan investigations into the relief effort failures, but Billmon is sarcastically skeptical. I also have doubts that the [censored] responsible will ever be punished. Criminal negligence, and Bush will be handing out medals to all of them. Billmon points out the reaction of FEMA to the hurricanes that hit Florida last year, before the election, was completely different than the reaction to the hurricanes this year. 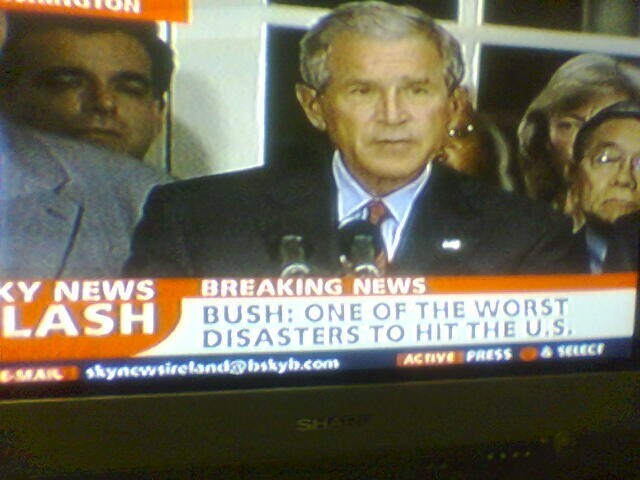 Oddly enough, the major relief efforts didn't start in NOLA until Bush came down for a photo op. If you haven't seen the clip this MetaFilter thread links to, of Geraldo Rivera and Shep Smith screaming the truth at the talking heads on the FOX news network, then you need to go check it out. I can't stand Rivera, but this is one of those rare times he's worth watching. Over at Kos, Hunter rants and describes this disaster as what it is: Unforgivable. A howl of outrage at the incompetence of the rescue efforts, while BBC News' Matt Wells tells it like it is. As does Steve Gilliard. Dave also rants, and includes a picture of those school buses that should have been used before the hurricane hit to evacuate people who didn't have cars and couldn't get out on their own. I can't go on. I'm sounding shrill even to myself. But I cannot express my fury at the people who sat on their hands or played politics with red tape while people were drowning and starving in New Orleans and elsewhere in the hurricane's path. I can't even begin to articulate the rage that's building inside of me. The actions of the government during this disaster are truly unforgivable.